As previously promised Popsicle week has at last arrived. 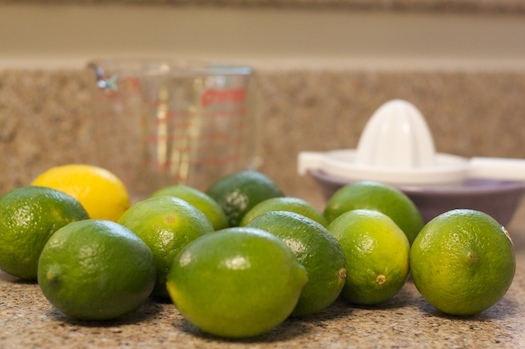 Thankfully these pops are awesome because I think I gave myself temporary carpal tunnel syndrome after juicing eight limes by hand with a ridiculously flimsy plastic juicer. Obviously a sturdier tool is going right to the top of my shopping list. By the time I finished with my popsicle prep hard labor my hands were completely shriveled from the lime juice and looked as though I’d been soaking in a hot soapy bath for two hours. 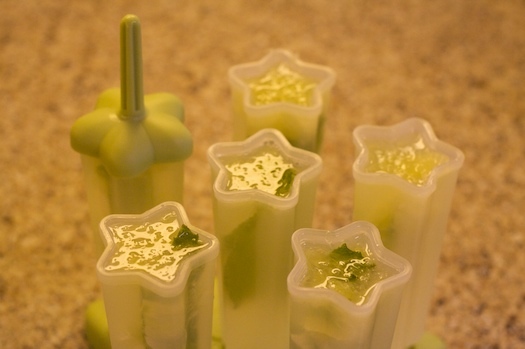 The remainder of the recipe is dead simple though and since I only made one batch of pops with my new Shooting Star Pop Molds I had half a pitcher of mojito mix left over. A few extra splashes of rum, some ice cubes and immediate cocktail satisfaction is yours. This definitely makes the wait for these icy citrus dreams slightly more tolerable. Makes 24 two-ounce ice cube-tray pops, six 8-ounce pops, or eight 6-ounce pops (Note: Or be like me and make six popsicles and three nice sized mojitos to share while you’re waiting for the pops to freeze). For more popsicle ideas and information please visit IcyPops.com. How fun! I’ve been thinking about making a mojito granita, but this looks even easier! I am so excited about popsicle week, just in time for July 4th parties!! I can’t wait to try these with my friends. A nice cool treat for us Texans will be very necessary this weekend! OMG! these sound fabulous. i’m always looking for new ways to consume my cocktails. OMG…popsicles with alcohol in them! I think these could become a BBQ favorite! Oh, this makes me wish I had popsicle molds! So do wedges of fruit end up in each pop? This reminds me of a mystery pop I had while traveling in Japan during the summer several years ago. Maybe someone here can help me recreate a wonderful Japanese “pop” I had at a outdoor market. The vendor had a huge block of ice out of which divits or shallow holes were carved. Inside those holes were slices of mandarin or plum or a single large strawberry. Surrounding those fruits (and holding the bamboo stick) was a jelly like substance, clear as the ice, and sweet like rice candy. If I remember correctly they pierced the fruit, swirled it in this substance, and set it into the small icy hole. It froze instantly, suspending the fruit into a crystal ball, but when removed and licked melted into a gooey (but not quite as gooey as mochi) slurp around the bite size piece of fruit. It was so delicious I always regret never getting the recipe, but I could’ve eaten a hundred of them they were so light and refreshing. Anyone here know what I’m talking about or can help me find out? I am *very* excited about popsicle week. keep the posts coming! 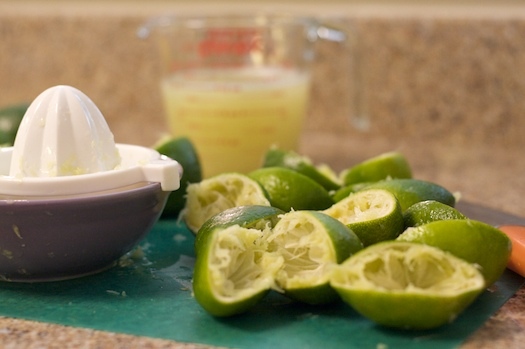 How did you do with peeling the limes? When I made the Mai Tai pops I had a bear of a time getting that done. And man, when you get to that lime in the middle of the pop…There are no words, and if there are I’m not sure how to spell them. I’m working my way through the Cantaloupe & Mint (a variation on the Honeydew) pops. Word to the wise, go easy on the lime. Mine are overpoweringly limey. I’m instantly in love! These are just too cute! Perfect for summer and especially perfect for my 4th of July weekend by the pool! Thank you so much! Wow, what a fabulous idea! Just have to make sure to specially mark them, so the kiddies don’t grab them by mistake! What a fantastic idea… and the leftover cocktails to boot is a bonus! Just found you via stumbleupon – I think I’ve just worked out how to use it properly! These look fabulous – a must-make for my bbq this weekend!! Oh my gosh, I’d love one of those! Maybe two. These look great! I love mojitos! Yum yum. 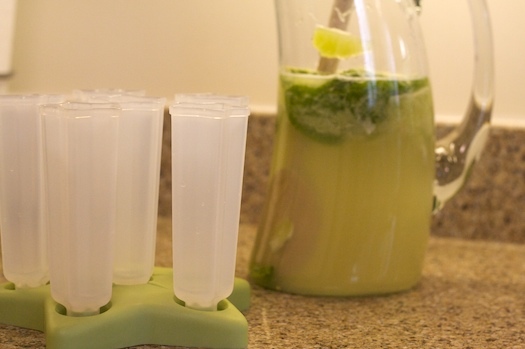 I love mojitos… all that lovely limey goodness. Can’t wait to make these when Summer hits over here. This looks like a refreshing and fun way to beat the heat. And how can you go wrong with mojitos? Love it!! These sound incredible. So refreshing! I really like your blog design too btw. It’s very clean. Awesome idea and recipe. This actually reminds me a bit of the typical Mexican “paleta” but with a kick. Mojitos are my absolute favorite.. I can’t believe we haven’t attempted these sooner! At first, because I live in Houston I was worried about them melting because it gets so hot, but then I realized that they probably wouldn’t even make it out of the kitchen! Yummy. Thinking of doing these as a Zoku Quick Pop, have you tried any alcoholic mixes in yours yet?